I like to draw and make stuff. Let's collaborate. Sarah Hurwitz was born in Phoenix, Arizona, received a Bachelor of Fine Arts in Painting and Ceramics from the University of Colorado at Boulder in 2005 and a Master’s Degree in painting from the University of Arizona. She now works as lead artist for a design/build firm that makes large scale interactive installations for children's libraries (See their cool stuff at BurgeonGroup.com). Hurwitz also occasionally teaches drawing at Paradise Valley Community College. She once traveled on a ship around the globe, and has exhibited in Arizona, Los Angeles, Colorado, Chicago and New York City. 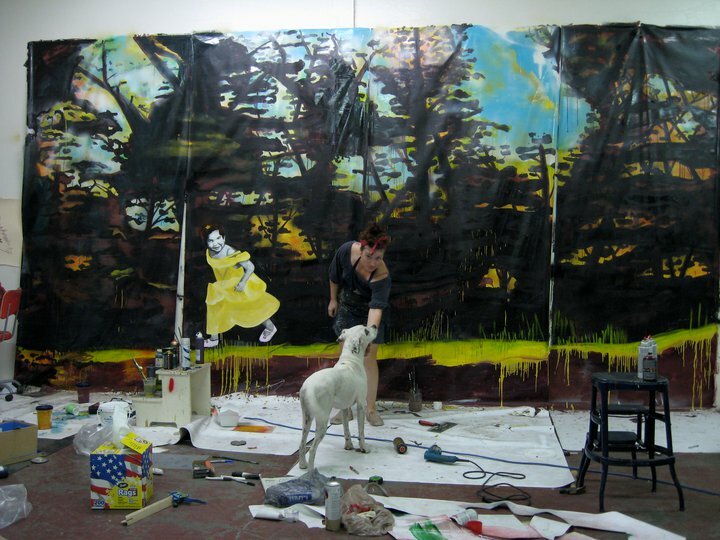 Her work mainly focuses on large scale paintings and installations about detaching yourself from the duties of daily life by retreating to the fanciful environments of childhood imagination. She lives and works in downtown Phoenix with her son, her Stephen and her dog. Everything featured on this site is copyrighted to Sarah Hurwitz, do not use or duplicate without permission.